Sarah Schulman’s writing is bold, provocative, and refreshingly unrepentant. First published in 1994, My American History: Lesbian and Gay Life During the Reagan and Bush Years combines critical commentary with a rich and varied collection of news articles, letters, interviews, and reports in which the author traces the development of lesbian and gay politics in the U.S. 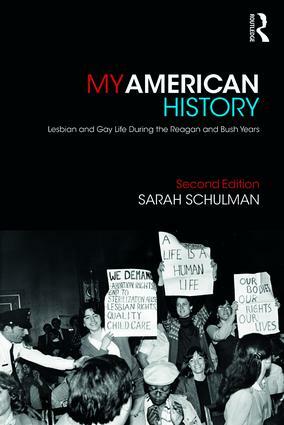 In her coverage of many tireless campaigns of activism and resistance, Sarah Schulman documents a powerful political history that most people – gay or straight – never knew happened. In her Preface to this second edition, Urvashi Vaid argues for the continued relevance of Schulman’s writing to activism in the 21st century, particularly in light of the resurgence of the right in American politics. Also included is a selection of articles by Sarah Schulman for Womanews, in their original print format, with illustrations by Alison Bechdel. The book closes with an interview with the author, conducted by Steven Thrasher, especially for this new edition. It explores AIDS and homophobia during the Reagan/Bush administrations and at the dawn of the Trump era. My American History is a collection that gives voice to both the personal and political struggles of feminist and lesbian and gay communities in the 1980s. It is an important historical record that will enlighten and inform activists, as well as academics of women’s, gender and sexuality studies, in the 21st century. Who wants to drive blues out of business? Is lesbian culture only for beginners? Is the nea good for gay art? What ideals guide our actions? Whatever happened to lesbian activism? Who is to Blame for the TB Epidemic? What is the role of gay film festivals?